During the summer, local Marrakchis will always tell you that their city is better during the night. Many often chuckle at the idea of leaving indoors and traipsing around the streets during the day on the tourist trail, preferring to nap the day away inside. Indeed, Marrakech summers are always very hot; just this last week the temperature has hit 40ºC (104ºF) daily. In contrast to the dry heat of the day, the cool night provides the perfect backdrop for activity. It is because of this that the streets come alive at night. At night, in both Gueliz and the Medina, the streets are the streets are filled with local Marrakchis alongside Moroccan and international tourists enjoying everything from a coffee at the local café to a mint tea on a terrace. One ‘must-see’ nightime activity is the world famous Jemaa el-Fna square with it’s food stalls, performers and storytellers. Here at Hip Marrakech we are not suggesting you become nocturnal, but we urge you to venture out at night in order to experience in full the magic of Marrakech. 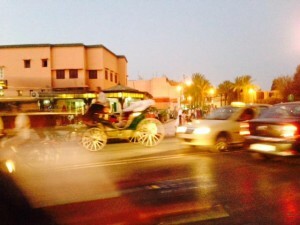 This entry was posted on Wednesday, August 20th, 2014 at 12:02 am	and is filed under Marrakech, Photo a day. You can follow any responses to this entry through the RSS 2.0 feed. Both comments and pings are currently closed.